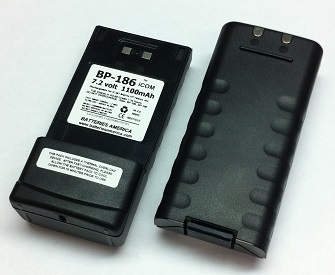 BP-186 : 7.2 volt 1100mAh rechargeable Ni-Cd battery for ICOM marine radios such as IC-M1. Brand new & exclusive; designed by Batteries America ! Replaces original BP-185, BP-186. Re-charges with stock ICOM charge cradle (AD-58 + BC-122A), or with our exclusive EMS-186 desktop Rapid-Smart charger. Pricing is for 1 battery pack. Picture shows 2 views of the battery. The BC-122A is a Wall Power Supply for ICOM equipment (for IC-M1 radio). Plugs right into the AD-58 Charge Adapter. Replaces original BC-122A power supply. BP-186h : 7.2 volt 2000mAh ENELOOP Ni-MH battery for ICOM IC-M1 marine radios. BP-186h 7.2 volt 2000mah rechargeable ENELOOP Ni-MH battery for ICOM IC-M1 marine radios. Provides extended operating time. Arrives to you PRE-CHARGED & READY TO USE ! EMS-186 : Desktop Rapid Charger for ICOM style BP-186, BP-186h, BP-185. EXCLUSIVE ! EMS-186: Desktop Rapid Charger for BP-186, BP-186h, BP-185 batteries (fits ICOM IC-M1 radios). Includes UL-listed wall Power Supply (capable of worldwide use! ). Provides safe, fast, smart charge with automatic shut-off.